Our predecessor organization originated 122 years ago based on the desire to improve patient care through the mutual sharing of clinical information by physicians not only in the United States, but also globally. Education activities formed the basis for professional associations for many years. Even as the demand and necessity for additional services have arisen as the delivery of healthcare has evolved, education has remained an anchor function of our organization. Our Foundation takes great pride in providing the highest quality education programs related to otolaryngology, as evidenced by our ACCME accreditation at the highest level. Advancements in the field of education in terms of theory, process, targeted learners, and dissemination of education products have made it clear that optimal results will require active interaction with a variety of partners. As we work to structure principles of interactive, shared learning that incorporate tools such as animation, digitization, gamification, simulation, and a Learning Management System that supports dissemination through all current media, we welcome partners. There are three significant areas in which the Foundation is working with others with similar interests to produce the best possible results. I recently attended the “Future of Surgical Training” Conference in Chicago, IL, that was hosted by the American College of Surgeons. Representatives from all the surgical specialties were present. I was impressed with the breadth and depth of discussion regarding all aspects of surgical training and individual reports from each specialty detailing the specific nuances and challenges they face. One area of consensus centered around the need to improve the understanding of expectations between academic faculty and resident trainees in surgical programs. The creation and delineation of shared goals are necessary to traverse the new training paradigm that exists today. Our Faculty Development Program is designed to help “train the trainer” and currently contains material on developing outcome objectives, effective presentations, and adult learning principles. Later this year, the Foundation will release the next set of courses, including conscious and unconscious bias, how to effectively run a meeting, how to review and critique scientific articles, and a primer on simulation and how it is being used in our training programs, as well as future possibilities. The ACCME has long supported the goals of Maintenance of Certification (MOC) and the importance of alignment between accredited CME and MOC. We applaud the American Board of Otolaryngology (ABOto) for its collaboration with the ACCME to develop criteria for our profession that will allow the Foundation’s CME education to support our members in their continuing lifelong learning quest. This dovetails with our efforts with the ABOto to provide an opportunity for MOC credit for participating in our clinical data registry, Reg-entSM. We feel it is critical to include patient and public education as a part of our mission, particularly in the unregulated waters that offer unvetted information about many conditions we treat. This will be particularly important as hearing aids become available over-the-counter in the near future. The Foundation’s new website, designed specifically for patient and public education, will involve a partnership with representatives of the patient community and our subspecialty societies as we strive to become “the trusted source” for patients worldwide with otolaryngologic diseases. When this new site is launched at the Annual Meeting in Atlanta, Georgia, it will feature in-depth information written in a fashion that our culturally diverse patients can understand and use to help make informed decisions about their own healthcare. We have worked to enhance our products and services through AcademyU® for all our members through “Member+” and “Home Study Course+” and by providing all-inclusive access to education activities. Be sure to check out our newly designed and better-than-ever AcademyU.org. 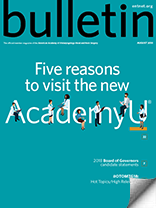 This issue of the Bulletin highlights several education offerings. All of us owe a great deal of thanks to the volunteers across our specialty who dedicate a significant amount of time and effort to identifying and creating the premium content that you have come to expect. 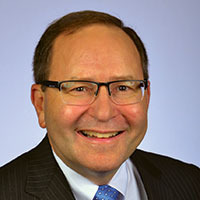 Your Coordinator for Education, Richard V. Smith, MD, leads our education committees that continue to deliver innovative courses and resources ahead of schedule. Our education staff, led by Johnnie White and Tirza Lofgreen, also deserves our gratitude for the exceptional job they do of assembling, formatting, and disseminating the extensive work of the committees, enabling it to reach our learners across the globe.